These unique, full function space saving, patented, converters offer the same performance and options as our full rack units but require 1/3 the rack space of a traditional unit and are only available from L3 Narda-MITEQ: 1/3 Rack Mount Fiber Optic Links. L3 Narda-MITEQ can customize the electrical specifications and packaging of all our fiber optic products to meet your specific requirements. 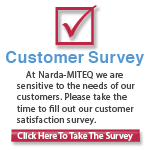 Please let L3 Narda-MITEQ be your custom fiber optic solution. FDA/CDRH Class I laser products. 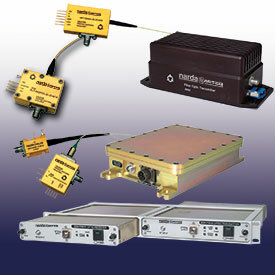 All transmitter versions of the SATCOM Fiber Optic Systems manufactured by L3 Narda-MITEQ are Class I laser products per the CDRH, 21 CFR 1040 Laser Safety requirements. Furthermore, all transmitter versions of the SATCOM Fiber Optic Systems are Class 1M laser products per IEC 60825-2.